I just completed a new list that gets pretty much all the bobbleheads up to 2008. This includes a photos of each (except a couple that I haven't found yet), who made them or gave them away, the year, and how many where made, if known. You can view the list here. I also have added a list of current pricing info courtesy of Cathy Hunter who compiled the data from eBay.com sales here. The latest collecting craze in racing memorabilia is bobblehead dolls. Many of the wobbly headed caricatures of famous jockeys, trainers, and horses have been given out as racetrack promotions since 2001. Here are photos of each along with info to help you in collecting your set. These items are VERY popular and while prices were escalating on the ones with lower distribution, the glut of choices now has stopped this to some extent making them more affordable to more collectors. For more information although now a bit dated, you may want to read this article from the Daily Racing Form. The prices listed below are from recent completed eBay auctions as of 11/7/2003 and are for unsigned bobbleheads only. Autographed ones generally go for more, sometimes as much as two or three times more, depending on who it is. If you hear of any new giveaways at your local track, a previous giveaway that I don't have listed, or more information on any of the bobbles shown, please let me know. Use the list to the right to jump directly to the bobblehead you are interested in. To celebrate the 31st anniversary of Secretariat's win in the Belmont, Secretariat.com has issued a new limited edition Ron Turcotte bobblehead. Only 1973 were made and they are available both plain and siged by Turcotte. This one is 7" tall, comes with a numbered certificate, and a portion of the proceeds will benefit the Secretariat Foundation. It is on sale for $39.95 unsigned and $64.95 signed at Secretariat.com. It hasn't shown up yet on eBay, but should start to soon. Arlington Park gave out 5000 Rene Douglas bobbles on Memorial Day, May 31, 2004. A large portion of these are already on eBay, but prices haven't settled down yet. Something in the $15-$20 range should be reasonable once the market stabilizes. A new Secretariat bobble has been released for 2004 to commemorate the unveiling of the new bronze statue at the Kentucky Horse Park. Only 5000 were made with them available both plain and siged by Penny Chenery. This one is 5.5" tall and 7.5" long and proceeds will benefit the Secretariat Foundation. It is on sale for $24.95 unsigned and $ $39.95 signed at Secretariat.com. It is also now showing up on eBay, but for $35 unsigned and as much as $75 signed! Bob Baffert was the first trainer bobblehead made. 20,000 were given away on June 15, 2002, at Hollywood Park. This one can also be found easily for bid on eBay in the $10 range. If one doesn't show at that link, try this one. Jerry Bailey has joined Laffit Pincay as the second jockey to have two bobbles made in his likeness. The first was given away at Saratoga on July 28, 2002. 60,000 bobbles were made but only 50,000 or so were picked up on race day. The rest have been available for sale in the NYRA Store for $14.95 plus shipping and they still have some there, but most of the rest were finally given out on Sunday September 8, 2002, at Belmont. These are always available for bid on eBay right now. If one doesn't show at that link, try this one. Because it was so over produced, prices are generally $10 or less. Note that the above searches will likely turn up both version of the bobble, so pay attention to the silks to make sure which you are bidding on. The second Bailey bobble was made by Sunland Park in Texas and has been given away in several locations including the Churchill Downs Sports Spectrum on Feb. 9, 2003, and Lone Star Park on Feb. 22, 2003. It is identical to the Saratoga one except for the silks and the lack of the Saratoga roof logo on the base. Total production is supposed to be 2400, but some sellers are claiming the 800 given away by Churchill are the total production. It is much tougher to find and you can expect to spend at least $50 to get one. You can generally find this one only by this search on eBay. Steve Cauthen was the first jockey bobblehead to be given away by Turfway Park when they gave out 7,000 on March 22, 2003. This is the first US one to have crossed arms and he will be wearing the silks of Triple Crown winner Affirmed who he rode. They easy to find on eBay for sale in the $20 range, more if autographed. If one doesn't show at that link, try this one since you never know if they used bobble or bobblehead in the description. Only 5,000 Jon Court bobbles were given away on August 28, 2002, at Ellis Park. The line up for admission started hours before the track opened and stretched out into the parking lot. 2500 of the same bobblehead (same silks) was given out at Hoosier Park on October 4, 2002, for the Indiana Derby. Either can also be found easily for bid on eBay and is going for around $15-$20 right now. If one doesn't show at that link, try this one. The only difference between the two is the track name on the base and box, plus the collector card enclosed is different. Only 10,000 Pat Day bobbles were given away on November 3, 2001, at Churchill Downs and they were gone within 30 minutes! This one can also be found easily for bid on eBay but prices are down on this one from a high of $100+ to the $80 range currently. If one doesn't show at that link, try this one. 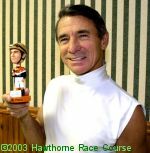 Jockey Earlie Fires poses with his bobble. On April 26, 2003, at Hawthorne, an Earlie Fires bobblehead was given away to the first 3,000 fans with paid admission. Fires is featured in the familiar silks of Leonard Lavin. Not all were given away due to the lack of publicity for the event, so call the Hawthorne gift shop (1-708-780-3700) to see if they have any for sale before paying a premium on eBay. They are on eBay going in the $25-$30 range. Sandy Hawley was given away at Woodbine on September 15, 2002. Although only 3300 were given away that day, 6000 total were made and will be used in future promotions. The whole thing was handled badly in my opinion. The track limited them to one bobble per person and the security people were very rude to customers who tried to get more than one, even though there were quite a few left unclaimed at the end of the day. They are getting tough to find, but eventually show up for bid on eBay closing in the $35-$40 range. If you want something very unusual for your collection, the Hong Kong Jockey Club has issued 8 different bobbleheads for jockeys based at their tracks: Gerald Mosse, Vincent Sit, Felix Coetzee, Weichong Marwing, Anton Marcus, Dwayne Dunn, Howard Cheng, and Simon Yim. They are only available for sale in their gift shops for $90HK (about $11.50US) and a few have made it to eBay. Each bobble is 6 1/4 inches tall. They all have a distinct pose and silks and show more personality than most of the US bobbles. You can see them if they have any current ones in their giftshop. Some are starting to show up on eBay in the $20 range. Try this search and this search to find them on eBay. Hollywood Park gave away 20,000 Julie Krone jockey bobbleheads to fans on November 30, 2003. These should show up soon for advance auction on eBay here for $10-$15. The first bobble to be given out was jockey Chris McCarron. 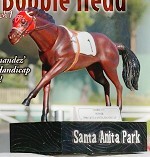 Only 20,000 of this bobble were given away on July 1, 2001, at Hollywood Park. This one can also be found easily for bid on eBay and goes in the $20-$30 range. If one doesn't show at that link, try this one. Hollywood Park followed up with 20,000 Laffit Pincay bobbles on July 15, 2001. This one is getting harder to find but does show up for bid on eBay, going for around $60. If one doesn't show at that link, try this one. Since both this one and the new Calder Pincay show up on the eBay links, be sure to read the description to make sure you are bidding on the version of Pincay you want as the prices are quite different. Calder Race Course issued the second Laffit Pincay bobble on December 19, 2002. This one is in the late Fred Hooper's silks and 7500 were given away. You can find these up for bid on eBay in the $30 range. If one doesn't show at that link, try this one since you never know if they used bobble or bobblehead in the description. These links will bring up both this and the earlier Hollywood Park Pincay, so read the description carefully to make sure you bid on the one you really want. Only 5,000 Mario Pino bobbles were given away on June 21, 2002, at Colonial Downs. This one is a bit tougher to find, but comes up for bid on eBay going in the $30 range, more if autographed. This is a bobble of Seabiscuit's jockey Red Pollard. This was to have been a giveaway at Thistledown in 2004 but it was cancelled. Looks like one guy bought most of them and is trying to sell them off but they aren't brining much, less than $10 if auctioned and under $20 for a Buy-It-Now. You may find a few up for bid here on eBay. I would love to know more about this one like where it was to be given away! This year's Saratoga giveaway was last year's top jockey for the meet, Edgar Prado. I haven't seen figures, but they probably did the same 60,000 quantity as last year since it is easily found up for bid on eBay in the $10 range. Churchill Downs issued 10,000 of this Nick Zito bobble on November 23, 2002. This is the second bobble from that track and the second trainer bobble. It was originally going to be D. Wayne Lukas, but he declined to give permission to use his image and name. You can find these up for bid on eBay in the $10-$15 range. If one doesn't show at that link, try this one since you never know if they used bobble or bobblehead in the description. There is also a baseball player named Zito who has a bobble so be sure to read the description and make sure you are bidding on the right Zito. Churchill Downs did three mini race horse bobblehead giveaways over the summer to tie in with the Triple Crown of Secretariat (same pose as the first limited edition), Affirmed, and Seattle Slew. 7500 of each was be given away. Currently all three of these are up for bid on eBay for around $10-$15 each for Affirmed and Seattle Slew and $30 for Secretariat. Sets of all three go in the $40. You can find them on eBay here: Affirmed, Seattle Slew, Secretariat. Note that the Secretariat search will also turn up his two previous larger bobbles, so read the description carefully before you bid. 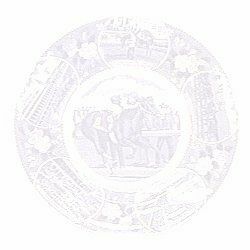 Seattle Slew is also still available from Secretariat.com for $24.95 if you don't want to bother with bidding. I don't know the number given away, but this is Black Ruby the champion racing mule who was given away at the California Fair meets this summer (the one I have came from Ferndale in mid August). She doesn't show up much on eBay, you may find her up for bid here for $20-$30. The interesting thing about this bobble, is they recycled the Seabiscuit mould but decreased the body size by about 10% since mules are smaller, made the earls longer, and changed the tail. They left the head the same size as Seabiscuit so it looks a bit awkward, but definitely something different and hard to find. Churchill Downs gave away 7500 of this Funny Cide bobble to fans on November 22, 2003. These are available on eBay for around $20 or you can order it from Secretariat.com for $24.95 if you don't want to bid or worry about who you are buying from. Seabiscuit now has several bobbleheads and the next three entries cover some of those. The first Seabiscuit bobble was given away at Bay Meadows on October 19, 2002, after several postponements due to a dock workers strike. It was the first horse bobble to be given away (Secretariat was the first horse, but it was not a freebie) and only 8,500 were made. Since several others from the same mould have been given away at various tracks including River Downs and Hoosier Park. This means it is easily available and many now go unsold. If you just want the bobble and aren't particular about which track, don't pay more than $10-$15 for it. It is available for bid on eBay. Try this link as well since you never know for sure whether they list it as bobblehead or bobble head. The second Seabiscuit was given out on March 1, 2003, at Santa Anita for Big 'Cap day. It is identical to the others above than the base, but adds an audio feature and a total of 20,000 were made. If you press a button you hear the stretch call of Seabiscuit's win in the 1940 Santa Anita Handicap by Joe Hernandez. This one has held value better since it is the only audio bobble so far and is currently going in the $30 range. You can find mostly the audio ones with this search on eBay or this one, but be sure to use the other two searches above or you may miss some. Finger Lakes racetrack in New York gave away 2000 of this Seabiscuit bobble to fans on August 3, 2003. This is certainly a different bobble from before since it has his jockey up! You can find him up for bid here or here for around $25. Read the description carefully as there are several different Seabiscuit bobbles to make sure you get the one you want. This one is also a bit of a mystery. The listings on eBay lead me to believe it was made to be a giveaway but that fell through and now the place who made them is selling them to recoup the losses. It is a double horse bobble of Seabiscuit vs. War Admiral. You may find one up for bid on eBay for starting prices of around $30, but only a few seem to sell at that price. This is another for which more info is needed. A new Secretariat bobble has been released for 2004 to commemorate the unveiling of the new bronze statue at the Kentucky Horse Park. Only 5000 were made with them available both plain and siged by Penny Chenery. This one is 5.5" tall and 7.5" long and proceeds will benefit the Secretariat Foundation. It is on sale for $24.95 unsigned and $ $39.95 signed at Secretariat.com. It is also now showing up on eBay, but for $35 unsigned. Laurel Park in Maryland gave away 4000 Xtra Heat bobbleheads on February 22, 2003. They had to postpone from Feb. 17th due to the big snowstorm down there. It is up on eBay for bid in the $10 range now. Prices have not been updated in ages, so take them with a grain of salt.